Ceibass Venture Partners – Don’t be Under-Saved, Under-Planned and Have Unrealistic Expectations About Retirement. 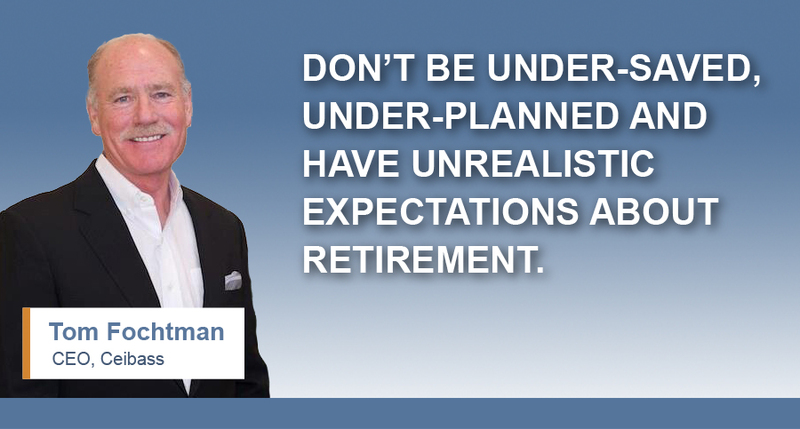 Don’t be Under-Saved, Under-Planned and Have Unrealistic Expectations About Retirement. The Enterprise Value Specialists at Ceibass work with many Boomer Generation business owners in the lawn & landscape industry to prepare their businesses for sale and help them get ready for retirement. That’s why it is with great interest that the professionals at Ceibass read this year’s Insured Retirement Institute’s Boomer Expectations for Retirement 2017 report. It is the seventh annual update on the retirement preparedness of the Boomer Generation. “And if selling your company will not bring enough money to your retirement war chest, you need to make changes now to increase the value of your business that will enhance the value of a sale down the road,” added Tom. Eighty-two percent of Boomers underestimate the percentage of their income that may be required to pay for health care. More than seven in 10 Boomers believe they can subsist solely on Social Security if they run out of money during retirement. Only 54 percent of Boomers have retirement savings, the lowest recorded in the seven years of the Boomer report. Click here for a PDF of the Insured Retirement Institute Boomer Expectations for Retirement 2017 — Seventh Annual Update on the Retirement Preparedness of the Boomer Generation.